Congratulations to Steven and Ellie on the birth of Oliver Peter David Nelson on the 21st September 2018. Lots of love from Gran and Grandad and all the family. RAE: After a short illness in Ayr Hospice on Friday 21st September 2018, Dorothy aged 82 years, beloved mum, gran, great gran, sister aunt and dear friend to many. Funeral on Tuesday 2nd October service in Masonhill Crematoium Ayr, at 1.15pm to which all family and friends are respectfully invited. Family flowers only please, bright colours to be worn. 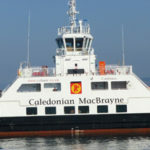 There will be a bus from Ardrossan ferry terminal to collect people at 12.00pm, going to the Crematorium and returning to Ardrossan ferry terminal at 5.30pm.